With the launch of the Apple HomePod, and pending the launch of a Bixby speaker, if there will ever be one, the major pieces on the smart speaker game board are now all in place. And so are the three major voice-controlled AI-driven smart assistants (sorry Cortana, you’ll have to sit this one out). That means, of course, questions on which one you should buy. “Should” is probably too strong a word, because it really depends on multiple factors. We can, however, give you the lay of the land so that you can decide better where to sink your hard-earned money into. Beauty is in the eye of the beholder and, to be honest, it’s probably not going to be the deciding factor on whether you will get a Google Home, an Amazon Echo, or an Apple HomePod. Buyers are more likely to base their decision on functionality rather than looks alone. Of course, that doesn’t discount the fact that some will be immediately turned off at first glance. The good news is that none of the choices are terrible. Yes, some might look better than others. Yes, the Google Home looks like an essential oil diffuser and the HomePod a dwarf Mac Pro with a sock. Still, none are going to be aesthetically atrocious, precisely because they were designed be seen as much as they are meant to be heard. The one thing to note, though, is that they are all cylindrical in shape. No getting around that. Figuratively, of course. They may be called smart speakers, but until Apple threatened to upset the market with its $350 audiophile version, the early players didn’t take the speaker part too seriously. As long as it produced understandable output, they were fine. Not that they were really bad either. For most intents and purposes, the Google Home and the Amazon Echo did adequately enough. Of course, the Apple HomePod is being raised as the king of audio quality among the three, and it better be for that price. After all, that’s where most of the build cost went. That said, Google tried to preempt the HomePod with its even more expensive Home Max, with a bit of success. There is still some heated debate on which of the two is better. Unfortunately, the Echo doesn’t have a model to go head to head with them. There is another part of the audio story: the input part. These speakers are designed to listen to you but it takes more than just a lone mic to do the trick. They should be able to hear you even from afar and no matter where in the room you are. HomePod users are reporting some of the best and most effortless experience followed by the Echo. The original Google Home, unfortunately, caused not a few to strain their voices in order to be heard. This is pretty much the bread and butter of these smart speakers. After all, it’s what makes them smart in the first place. Being able to access Internet information and services is essential to the success of these devices. This is also where the three of them diverge the most. Google is, of course, the king of search and it pretty much has that down to a T. That makes the Home the most excellent speaker to use when you always need facts in a flash. Google is also growing its collection of Actions and ties with third-party content providers. Unfortunately, it actually isn’t in the lead when it comes to that. Amazon has been at this game far longer than either Google and Apple and has had a head start. Alexa is almost the byword for smart speakers and AI assistants. But perhaps more importantly, and this might come as a shock to those who look unfavorably on Amazon, the Alexa works with more third-parties than either Google Assistant or, and especially, Siri. At the same time, it’s not that surprising, considering Amazon doesn’t exactly have its own calendar service, for example. Of course, Amazon also has its share of exclusivity. It won’t, for example, work any Google Cast device. You’d have to get a Fire TV dongle or box for that. This is also where the HomePod falls flat on its face. For all intents and purposes, it is an exclusive Apple device and you can only use it with Apple apps and services. But even then, it’s not complete either. It lacks some of the abilities that Siri has in its other incarnations, particularly on the iPhone. This makes the HomePod really more a wireless speaker first and a house for Siri only second. 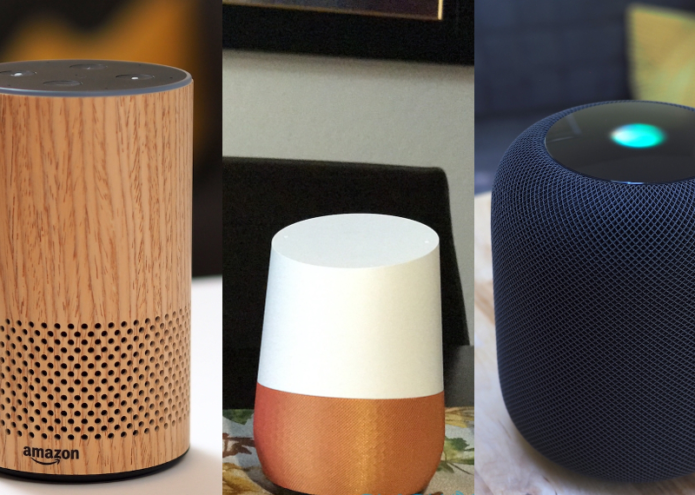 Smart speakers, however, are not meant to stand alone. They are meant to stand at the very center of your home. Your smart home, that is. These speakers are meant to be the control center of your hi-tech house, controlling and coordinating all your other smart devices and appliances. And that makes the topic of compatibility with those products a bit complicated. It’s hard to pin down this particular aspect because it is fast-changing. One smart home ecosystem or platform may announce support for the Google Home, Amazon Echo, or Apple HomePod at any time. At this point, Amazon again has the advantage of seniority, but Apple’s name weighs more. Google was the last to jump on board but it has ways of convincing other companies to support it. Bottom line: if you’re looking to buy a smart speaker for your already smart home, you will have to check the compatibility of your devices. Most work with both Google Home and Amazon Echo, but there are a few that are Apple HomeKit exclusives. There is no straight answer, as it depends on what you already have. If you’re still trying to build your smart home, then it’s easier. Just a bit. We can’t escape talking about price tags, but the situation is a bit skewed to one side. You really don’t have much choice when it comes to Apple. There’s only one $350 HomePod and nothing else. On the other hand, there are at least three choices for Google Home and Amazon Echo, and much more if you count third-party and upcoming products. On Google’s side, you have the $39 Google Home Mini as the bare minimum. It has pretty much everything you’ll need from a Google Assistant speaker but with a standard speaker and, because of a bug, almost no touch controls. The Google Home Max brings the big audio guns in exchange for a $399 fee. Soon, Smart Displays will give Google Assistant a face as well. There’s more variety on the Amazon side of the fence. There’s the small Echo Dot ($40), the display-enabled Echo Show ($230), the new Echo Spot “alarm clock” ($130), and the completely odd Echo Look fashion guru ($200). That’s not counting the dozens of third-party speakers that already have Alexa inside, including a speaker Moto Mod you can slap on a smartphone. If variety is your goal, then the Echo-system, pun totally intended, is for you. So which one should you buy? Of course, the answer is “it depends”. Admittedly, Apple fans have it easier. If you don’t mind being locked into Apple’s garden, use only Apple’s blessed services, and have an iPhone or iPad to set up the speaker, then the Apple HomePod is really a no-brainer. You have a bit more choice when it comes to the Amazon Echo, both in the number of speakers as well as the skills and services that it supports. That said, Amazon is no saint and it will lock you into some of its own services. And with its ongoing spat with Google, you might find yourself locked out of Google’s in the future. It might have been late in the IoT game, but Google is just as aggressive as Amazon in growing its turf. When it comes to search and information on the web, the Google Home has the home court advantage. In some ways, it is also a more open ecosystem but also a messier one. Perhaps the best thing about these smart speakers is that it’s the new hot thing in the tech market. It’s growing fast and will probably only explode now that Apple is in the scene. Even Apple might eventually open its doors to more integrations. And so the battle begins. Whose side are you on?